Choralbuch zunächst zum Gebrauch in den mennonitischen Schulen Südrusslands, edited by Heinrich Franz (1812-1889), a book of melodies for the hymns of the Mennonite church hymnal of South Russia, first edition at Leipzig, Germany, 1860, second European edition at Leipzig, 1880, American editions as follows: Elkhart, Indiana, 1878, 1918, and at least fourteen editions in Manitoba, the most recent published in 1981 at Altona. The last edition bears the modified subtitle, Zum Gebrauch in den mennonitischen Schulen and Kirchen in Canada. 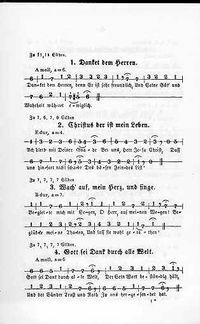 The popular name of this songbook has been Choralbuch mit Ziffern i.e., songbook with numbers, since the musical notes are indicated by numbers and not by the commonly used notation system. The book is in two parts, the first containing "all the melodies to the hymns in the Mennonite Church Hymnal," 163 in number, the second containing "112 selected melodies for church, school, and home." All editions are identical except that the European editions give four-part notation, while the American editions give only one-part notation and are thus much smaller. In 1897, a greatly revised edition was published at Neu-Halbstadt, Taurida, under the title Choralbuch, dem neuen mennonitischen Gesangbuche entsprechend, zum Gebrauch in Kirche, Schule and Haus, edited by Wilhelm Neufeld, containing a total of only 133 melodies. The original Franz Choralbuch was first prepared in manuscript form for use in the school which Franz taught, but gradually made its way through the Mennonite schools and churches of South Russia. 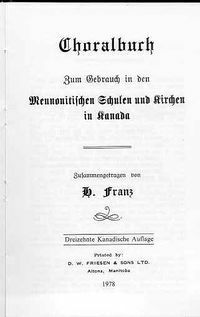 P. M. Friesen (Brüderschaft, 587) said in 1910 that Franz's Choralbuch "transformed the singing of the Russian Mennonites and still substantially dominates it." Epp, David H. "Choralbuch zunächst zum Gebrauch in den mennonitischen Schulen Südrusslands." Global Anabaptist Mennonite Encyclopedia Online. 1951. Web. 21 Apr 2019. http://gameo.org/index.php?title=Choralbuch_zun%C3%A4chst_zum_Gebrauch_in_den_mennonitischen_Schulen_S%C3%BCdrusslands&oldid=130425. Epp, David H. (1951). Choralbuch zunächst zum Gebrauch in den mennonitischen Schulen Südrusslands. Global Anabaptist Mennonite Encyclopedia Online. Retrieved 21 April 2019, from http://gameo.org/index.php?title=Choralbuch_zun%C3%A4chst_zum_Gebrauch_in_den_mennonitischen_Schulen_S%C3%BCdrusslands&oldid=130425. Adapted by permission of Herald Press, Harrisonburg, Virginia, from Mennonite Encyclopedia, Vol. 1, p. 565. All rights reserved. This page was last modified on 15 January 2015, at 04:09.